Do you think Russia should build new Aircraft Carriers and Battlecruisers? Do you think russia should start designing a replacement for the Kirov class? Other than implying that you behold an incorrect notion, what kind of response is this? The Granit is like a Scud... it is a 7 ton missile largely because it has a turbojet engine which requires a lot of fuel to carry the missile to the distance and speed that it manages. The Onyx is a much newer missile that uses a ramjet motor that means it can fly at supersonic speed much more efficiently than the Granit, and also the armour used in the Onyx to deflect CIWS shells and protect its warhead... which is over 600kgs BTW is relatively light Titanium. The result is a missile with similar performance that is approximately 3 tons lighter. Onyx is the replacement for Granit and Moskit. I am aware of three distinct weight-groups of Russian antiship cruise missiles that are heavier than Oniks. I mentioned two of the weight groups in my previous post. The heaviest weight group has been eliminated because of improvements in propulsion and electronics. I really didn’t understand what you were trying to say. Please elaborate. What he is probably trying to say is that Onyx and Zirconium are not export missiles... so unlike the Yakhont and Brahmos, both missiles are not limited to 300km range and 500km in payload weight. this means although lighter than Granit their performance is probably not actually inferior in many areas. Zirconium being a scramjet powered hypersonic missile yet to enter service. In addition, the Russian requirements for antiship missiles with warhead masses of around 1 ton and antiship ballistic missiles have not gone away. the kinetic impact of several tons of missile would sink many ships on its own with large HE payloads less useful... many modern missiles have incendiary payloads because fire is rather more devastating on board a ship than HE. Even the Russian have admitted that Kh-22B can reach a speed of over Mach 6 and an altitude of over 70 km (due to technical reasons, the real figures are substantially higher). The Kh-32 is described as having double the range and speed of the Kh-22M and is described as having a flight speed of more than mach 5 with a flight range of well over 600km. Why do you make that assertion? Give a reason. The English translation of UKSK is basically universal vertical launch anti ship/cruise missile launcher. It is pretty much the standard launcher for anti ship, anti sub, and land attack missiles for the Russian Navy and will be fitted to ships from Corvettes to carriers and also a version on submarines. BT-7 and T-26 were very good tanks, but in comparison to the list I gave in my previous post, they were nothing; they were strategic decoys. Similar arguments have been made over the decades about very similar issues. I have participated in many of those debates. This is just the latest round. One of the biggest problems of the Soviet Navy was customisation. They customised ship design and created very capable vessels. An example is the Udaloy class... an ASW Destroyer. It had Gas Turbine engines to chase subs efficiently, it had SS-N-14 missiles to hunt both subs and ships, it had an array of sensors and self defence systems. 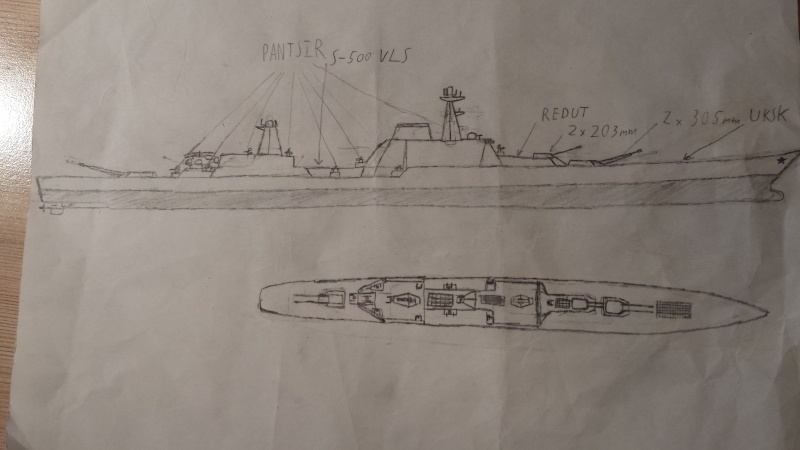 It is a similar size and from a similar time period as the Sovremmeny class Destroyers... different propulsion, different missiles and different guns and sensors and systems but similar size. Very little in common between the two otherwise similar sized vessels. No compatibility between the anti ship missiles they carried, very different propulsion. The result is that they made a dozen of each and they had a dozen of each type. A Sovremmeny was not much good for ASW, and the Udaloy was not great at anti ship... the SS-N-14 being a subsonic IR guided anti ship missile... a bit like the NSM really, though the SS-N-14 carried a torpedo too for use against submarines, which was its normal role. Now the Russian Navy has decided to get rid of all the thousands of companies that supply ten different anti ship missile and ten different SAM. The UKSK is a launcher that can launch land attack cruise missiles (ie Kalibr... based on the Klub missile with a range of 2,500km in the Russian model), a subsonic anti ship missile (again the klub with presumably the same 2,500km flight range as the very similar land attack cruise missile), a Supersonic anti ship missile (the Onyx with a 500km range... for export there is the Yakhont for anti ship only like the Onyx, and the Brahmos for anti ship and land attack... both the export missiles have a range of less than 300km and a payload of less than 500kgs). The launcher can also fire the 91RE2 which is a mach 2 ballistic missile that carries a torpedo as a payload to 40km range in the ship based model and 50km range in the sub based model. As I said all the ships in the Russian Navy will have this launcher so the next gen Destroyer with 4 UKSK launchers will be able to carry up to 32 missiles (each launcher has 8 tubes) in any combination. That means a modern destroyer can have 8 x Onyx missiles, 8 x 91Re2s, and still have 16 tubes for land attack missiles... compared with the Sovremmeny class ship with 8 Moskits or the Udaloy with 8 SS-N-14 anti sub torpedo launchers.. the new destroyer can have the firepower of both ships, the sensors to use them, and have a land attack capability only previous generation SSBNs had. the loadout can be changed at the pier before a mission or by reloading ship at sea. Not only that when a ship goes to another Russian port the propulsion is going to be more standardised, there are going to be fewer weapons and sensors so there are fewer sensor and weapon companies but it means fewer weapon types need to be stored and bought. Much easier to manage and maintain and operate. Here is a picture of proekt 12347 with Oniks missile. The first time I saw a picture of this ship with Oniks launchers was about 30 years ago. Now that they actually have some money the money seems to be going to production of new small vessels rather than upgrades of older vessels. the one place I can see this sort of upgrade being applied is with the Slava class cruisers as there is not sufficient internal space for the UKSK launch bins, but the Granit is no longer in production so if they want to equip it with a long range anti ship missile then Onyx or Zircon make the most sense. If they can fit a UKSK launcher angled in place of each of the twin angled missiles on the Slava that should mean 8 x 8 launchers and 64 missiles. Not as many as they project they will be able to fit in the Kirov upgrades where they are talking about 10 UKSK launchers with 80 missiles. But still reasonable. Re: Do you think Russia should build new Aircraft Carriers and Battlecruisers? This battlecruiser although looking old fashioned actually could have a lot of uses in modern sea warfare. First of all its guns aren't WW2 tech. The 305mm ones are EM cannons capable of firing projectiles to 300km and 570km rocket assisted. As for guns arent as accurate as missiles it can fire guided shells too at a fraction of the price of a full blown missile.If that isn't enough it has 6 UKSK cells. Keep in mind the guns can be replaced with extra UKSK VLSs in an alternate version, leaving the still very potent conventional 203mm turret(120-150km range with rocket assisted shells) . Unlike other modern ships it also has armor. Not WW2 steel belts but thick composite modern tank armor capable of protecting it from FAE blasts and close(but not direct) tactical nuclear detonations. It's spacious interior makes it very hard for narrow HEAT blasts to do much damage to it unless a critical area is hit(very unlikely). Combined with massive shore bombardment potential and heavy armor(forget about Bereg doing any damage to it) it would be the most effective ship in supporting amphibious landings. If you think if its a battleship then it still has bofors guns, its not the case with this one. It has completely contemporary(even superior to most of today's ships) multilayer AA systems that can effectively defend against ASM attacks. For defence against submarines it it doesn't have much more than the UKSK launchers but since it's a capital ship it's expected to have escorting destroyers. dude, as much as that would make the french(or anyone else, really) go for peanut butter and jealous, what the russkies really need is just a cheap and simple mistral equivalent.